Wood Planter Cube Boxes with Zinc Liner Set of 3. 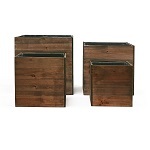 H-8", 6", 4"
Wood Planter Cube Boxes with Zinc Liner Set of 3. H-10", 8", 6"
Wood Planter Cube Boxes with Zinc Liner Set of 4. 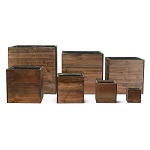 H-10", 8", 6", 4"
Wood Planter Cube Boxes with Zinc Liner Set of 7. H-12", 10", 8"
Wood Planter Cube Boxes with Zinc Liner Set of 3. 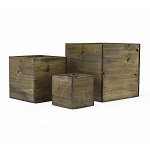 H-14", 12", 10"
Wood Planter Cube Boxes with Zinc Liner Set of 3. H-16", 14", 12"
Wood Planter Cube Boxes with Zinc Liner Set of 7. H-16", 14", 12", 10", 8", 6", 4"